Team G Square: Avarebele Mela 2016-A Tasty Treat To The Tongue!!! 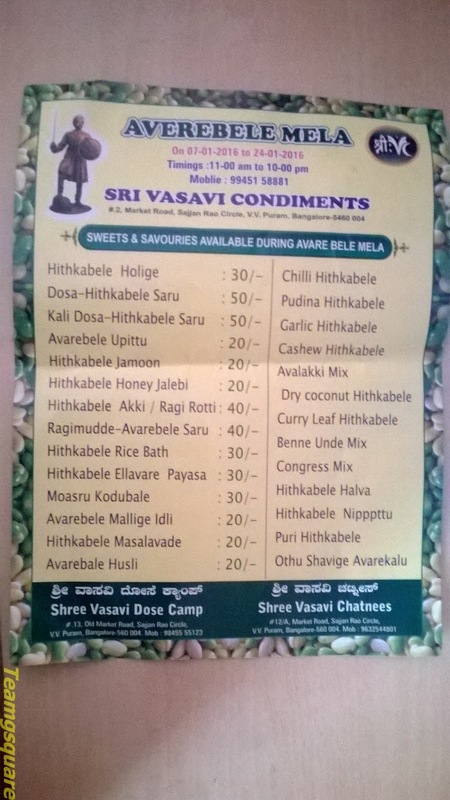 Avarebele Mela 2016-A Tasty Treat To The Tongue!!! I write this post as I'm relishing the Avare Kadlekai Chikki/Avare Peanut Brittle courtesy Avarebele Mela 2016 being held at Bangalore. A crunchy bite of it aroused my taste buds, breaking the peanuts and Avare as the jaggery melted along. Avarekai/Avarekalu/Avarebele (in kannada) or Field Bean/Indian Bean/Flat Bean belonging to the bean family of plant species is a seasonal crop and is famous among the south Indians. 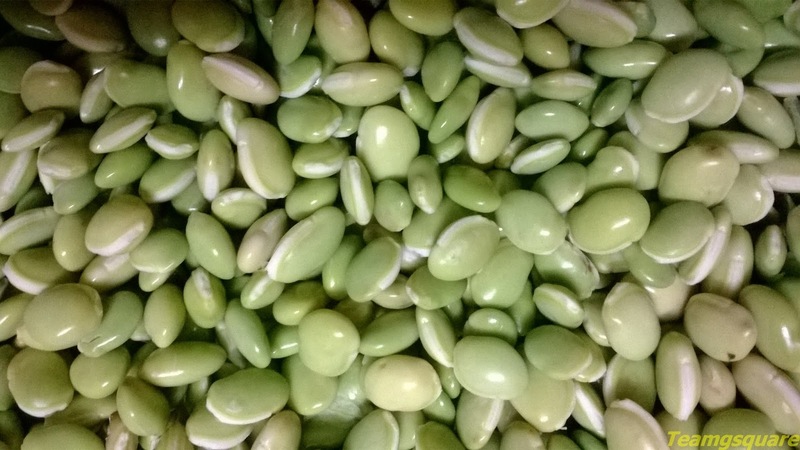 Another form is Hithkbele Avarekalu or Pressed Field Bean where the outer peel of the seed removed for use. Avarebele Mela, organised by Sri Vasavi Condiments and farmers from Magadi is held every year to celebrate the onset of avarekai harvest during the months of December-January. A not to miss for Bangaloreans and Avare lovers, the fest offers varieties of food items with Avare as its base ingredient. The stalls put up serve us with a wide range of delicious sweets and savouries including snacks, chats,etc., all of which exhibit the green color of Avare in someway or the other. Apart from being delicious, the foods also showcase various textures palatable to the mouth. We had a chance to taste the items of Mosaru Kodubele/Spicy Curd Ring, Othu Shavige/Rice Noodles, Hithkabele Holige/Sweet Flat Bread, and Masala Vada/Spicy Deep-Fried Fritters which we relished completely. The other sweets included Jalebis and Jamoons that seemed succulent and utterly mouthwatering. The menu offers more than thirty varieties of foods which are unique in every aspect. It is indeed a pleasure to our senses of taste, smell, sight, touch and sound! A must visit for the locals and tourists who are around during this time, the Avare celebration is truly an unforgettable experience which promises to bring us back again and again, year after year! Avarebele Mela has begun from 7 January 2016 and will go on up to 24 Jan 2016 from 11:00am to 10:00pm at Sajjan Rao Circle, V.V.Puram, Bangalore. So, if you are around remember to visit! Such an interesting and colorful post/photos for the day!! Thank you for sharing! I would love to visit there!! Wishing you a very Happy New Year!! Enjoy!! Glad to know about this interesting mela. I love Adare.. Jut back from Mysore and could see these being attacked in heaps on either side of road. Sure there was a rich harvest. I also visited Somnath Pura. I remembered you. Thanks for introducing such beautiful temples. I also visited a few more. Will come out with my posts.